Welcome to Plant Based Alchemy! Plant Based Alchemy has been set up to spread the word about the wonderful world of plants and their many uses. Plant Based Alchemy is the vision of Salena Walker, an experienced vegan cook and creator of plant-based raw chocolates, cakes and cosmetics, who has been living a plant-based life-style for over ten years. Salena has experienced the delights and incredible healing power of plants and through ‘Plant Based Alchemy’ Salena aims to share the knowledge she has gained by offering courses in many different aspects of plant-based living, including plant based diet and nutrition, cosmetics and growing. 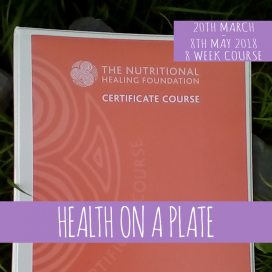 HEALTH ON A PLATE – 8 Week Course – Certified by the Nutritional Healing Foundation. Be inspired to create great and long lasting health. FAST TRACK TO HEALTH ON A PLATE – Certified by the Nutritional Healing Foundation. Be inspired to create great and long lasting health. Visit the Courses page for more.